A QMS to prove SEFAKO S.A. complies with the requirements of PN-EN ISO 9001:2009, PN-EN ISO 14001:2005, and PN-N-18001:2004 for design engineering, manufacturing and installation of water boilers, steam boilers, pressure vessels and devices, environmental protection installations, and steel structures. ASME's S and U stamp certification, entitling SEFAKO S.A. to apply the ASME mark to its power boilers and pressure vessels. Each product labelled with the ASME mark has been manufactured in compliance with the American Society of Mechanical Engineers. Directive 97/23/EC, entitling SEFAKO S.A. to apply the CE safety mark to its products. Each product labelled with the CE mark has been manufactured in compliance with European operating safety requirements and has been approved for marketing in the European Union. AD 2000 Merkblatt HP0 licensing for the production and export of power boilers and pressure vessels to Germany. BS OHSAS 18001:2007 to prove SEFAKO S.A. complies with the requirements of BS OHSAS 18001:2007 for design engineering, manufacturing and installation of water boilers, steam boilers, pressure vessels and devices, environmental protection installations, and steel structures. 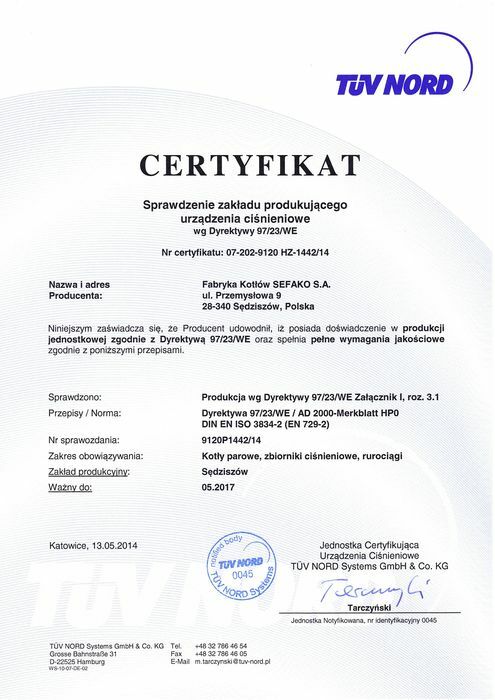 DIN EN ISO 3834-2, certification of quality assurance for production welding. UDT (Office of Technical Inspection): Plant Laboratory Approval Certificate to attest the high competencies of SEFAKO's Laboratory in research into the manufacturing, operation, overhaul and retrofitting of engineering equipment manufactured by SEFAKO S.A. Copyright © 2016 Fabryka Kotłów SEFAKO S.A.